Earthquake victims have been forced to flee their homes. Police caught up with one of the gang, but the other three fled. Thousands of refugees had fled across the border to Albania. Please don’t disturb your sister – she’s trying to do her homework. I didn’t want to disturb you in the middle of a meeting. Sorry to disturb you, but do you know where Miss Springer is? Her sleep was disturbed by a violent hammering on the door. I’m sorry to disturb you so late, but my car’s broken down and I don’t have my phone with me. 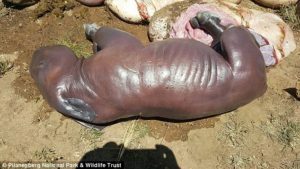 These heartbreaking images show an unborn rhino calf who died after its mother and sibling were shot and killed by poachers. The rhino was heavily pregnant and roaming Pilanesberg National Park in Mogwase, north-west South Africa, with its calf when they were hunted down for their horns. Photos show the poachers began hacking off the mother’s prized horn, but they were interrupted by park rangers and fled before they had time to remove it. Jo hacked a piece off the block of cheese. Three villagers were hacked to death in a savage attack. Her photograph is among my most prized possessions. When park staff tried to save the unborn calf, it was found to have died inside its mother’s womb. 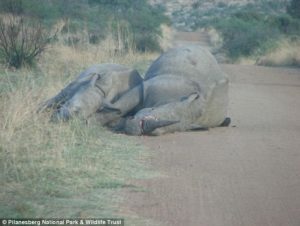 Pilanesberg National Park wrote on its official Facebook page: ‘There are no words. 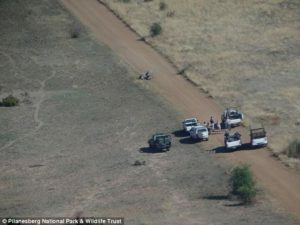 Pilanesberg National Park added in the post that a reward will be issued for any information leading to an arrest and prosecution of the poachers. A spokesperson for the park told MailOnline that the mother rhino was aged eight and the calf just two years old. The unborn foetus would have been due in February next year. I was devastated when the doctor told me the news. She was utterly devastated when her husband died. Thousands of people have left their devastated villages and fled to the mountains. 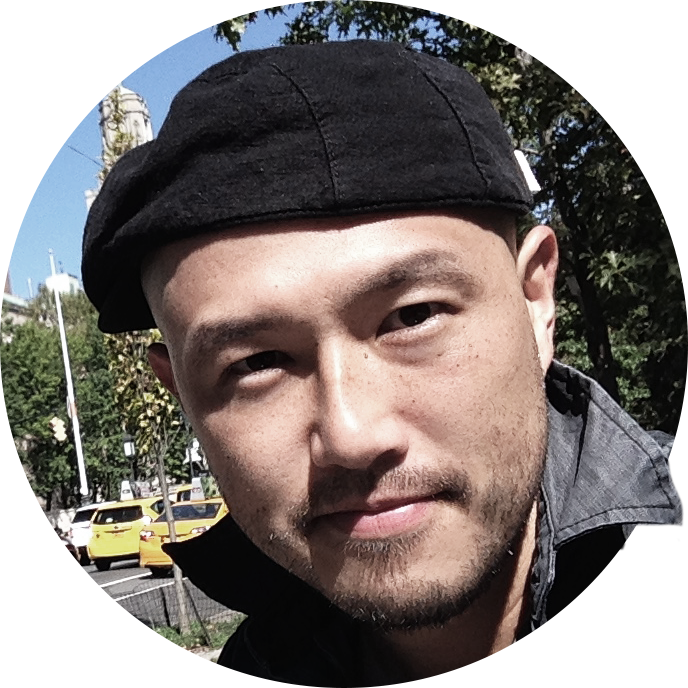 Police are offering a substantial reward for information leading to the man’s capture. Rewards for appropriate behaviour can be successful in teaching children. You deserve a day off as a reward for working so hard. He could face prosecution over the incident. A number of the cases have resulted in successful prosecution. This TV series is intended for young people aged 13 to 18. Her baby is due in May. ‘We have lost 16 Rhino and 3 unborn calves so far 2017 – that we are aware of,‘ the spokesperson said. Since 2007, more than 6,000 rhinos have been shot and butchered for their horns in South Africa alone. The majority of those have come in the last four years with around a thousand being killed every year since 2013. Sometimes the rhinos are shot dead, in other cases they are brought down with a tranquiliser gun before having their horn hacked off – leaving the rhino to wake up and bleed to death painfully and slowly. The province of KwaZulu-Natal, which has the greatest density of rhino in South Africa, has seen 139 slaughtered already this year. 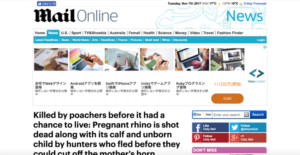 Despite countries such as China, Vietnam, South Korea, Malaysia and even India believing rhino has medicinal values, repeated studies have not found any evidence to support the claims. They saw their parents, brothers, and sisters butchered. Strong winds brought down power lines across the region. He managed to bring the plane down safely with only one engine. Johnson was brought down by an aggressive tackle just a few feet from the goal. I cut my finger and it’s bleeding. The area has a high/low population density. We were unable to move because of the density of the crowd. Thousands of people were slaughtered in the civil war. The animals are slaughtered in spring. Rhino horns are made from a protein called keratin, the same substance that human fingernails and hair are made of. The horn is essentially just a compacted mass of hairs that continues to grow throughout the animal’s lifetime, just like human hair and nails. It is similar in structure to horses’ hooves, turtle beaks, and cockatoo bills – however these animals are not hunted and slaughtered in the same way. Tragically tradition and cultural beliefs in some Asian countries mean the demand for rhino horn has not waned despite just some 20,000 white rhino being left in the wild. Poachers are now being supplied by international criminal gangs with sophisticated equipment to track and kill rhinos. A kilo of rhino horn is worth around $30,000 (£23,000) – making it more valuable than a kilo of gold at $25,000 (£19,000). That, essentially, is the difference between them. There’s a mass of competing anti-virus programs you can choose from. The explosion reduced the church to a mass of rubble. The forest is a mass of colour in autumn. His enthusiasm was waning fast. By the late 70s the band’s popularity was beginning to wane. They revealed that he had supplied terrorist organizations with weapons. Three people have been arrested for supplying arms to the terrorists. Can you supply a list of the guests? These are among the most sophisticated weapons in the world. It’s difficult to track an animal over stony ground. The terrorists were tracked to (= found in) Amsterdam.